The hay has just been cut in the fields surrounding my house in Sicily, and lies in straw-colored piles drying in the sun. At first glance, it looks like the colorful wildflower season is done. But if you look closely at the edges of the fields and rocky sections too rough to plow, you’ll find wildflowers still reign. A short walk through my backyard on the first day of May revealed a great variety of wildflowers to pick and choose from in making a wildflower bouquet. Pick a variety of shapes and colors. Add some white flowers – this brings light into the bouquet. Poppies are pretty, but they wilt almost immediately, so I usually just enjoy these in the fields. Some wildflowers open with the sunlight and close in the dark. Put your vase of wildflowers in a sunny spot in the house so that the flowers will be open during the day. Pick something feathery to fill out the edges of the bouquet. Arrange the bouquet with some of the shortest flowers near the base. Tie the bouquet together with a twist tie, trim off any foliage below the water line, and cut the bottom stems the same length before placing in the vase. Since many wildflowers are short, they look best in a small vase with a narrow neck. Change the water in the vase daily and your bouquet will last longer. 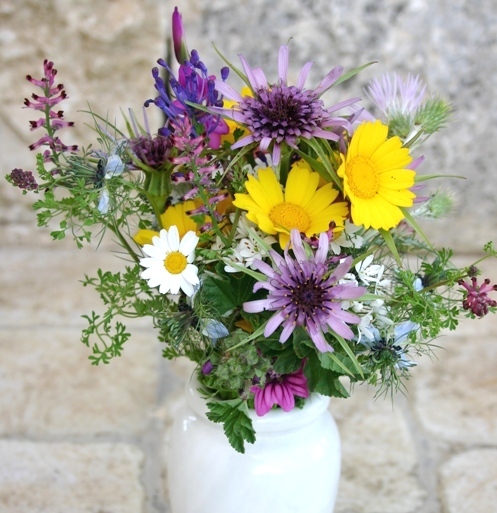 Here is a wildflower bouquet I picked this morning during a short walk in my backyard in Sicily. Daisies, gladiola, tassel hyacinth, love in a mist (nigella), wild onion & carrot, mallow, fumitory, thistle, salsify.